The Blue & Gold Loyalty Foundation supports the North Carolina A&T University Band Program through fundraising efforts. The Elite 100 is the designation for a select group of donors to the Blue & Gold Loyalty Foundation. Supporters were asked to donate $100 and were recognized for their support of the North Carolina A&T State University Band Program. As an alumnus of A&T and the A&T Band, I love providing designs for this cause. I made the official Blue & Gold Loyalty Foundation and had an idea for the Elite 100 logo. 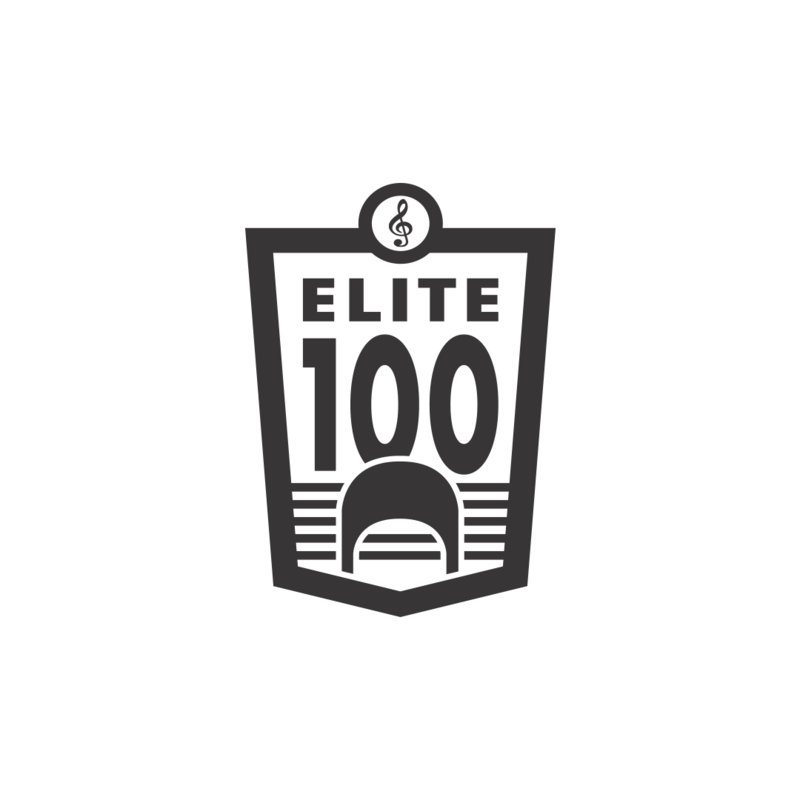 First, the badge shape mimics the Foundation’s shape but I made the weight of the stroke heavier for Elite 100. At the bottom of the logo, you can see the top of the same drum major hat that is prominent in the branding of the Foundation. The drum major is the student leader of the band. The Elite 100 are somewhat like the drum majors of the donors. The top of the hat represents the pinnacle of giving. The goal is to encourage supporters to strive to give that extra for a great cause. The Elite 100 text inside is written in a thicker font with the 100 being the most visible. The number 100 represents the amount being given per supporter as well as the name of the recognition so it needed to be front and center. The sea of lines at the bottom represent the musical staff, 5 lines & 4 spaces. 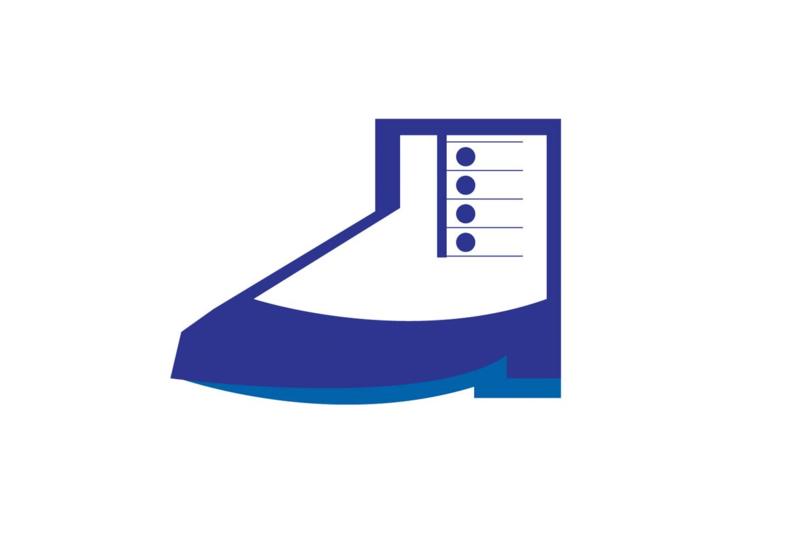 Another musical reference can be seen at the very top of the logo. 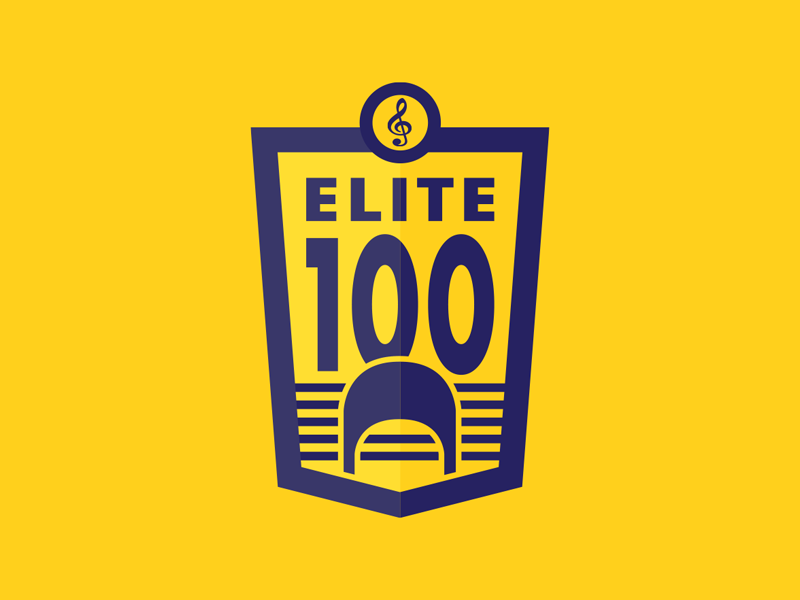 The treble clef, along with the drum major, also ties the Elite 100 logo to the Blue & Gold Loyalty Foundation logo. This project is another example of my calling to design with purpose. I love the A&T band program. As an alum, I have a duty to use my skillset (and my dollars) to support in any way possible whenever I can. Fundraising is a necessary practice for band programs across the country, especially those that see their budgets dwindling. Programs that see success in fundraising translate the interest they have gained from performances into donations. Investing in brand building and communication is the best way to reach potential donors. If you want to fundraise with any success in 2016 and beyond, you need to invest in your logo(s), visual brand identity, social media, and overall communication strategy. Capitalizing on the power of your brand and communicating with clarity maximizes the effect of your effort.